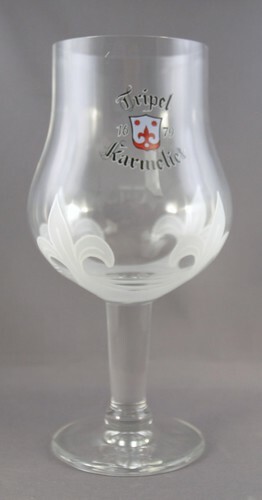 Tripel Karmeliet beer glass from Bosteels Brewery in Buggenhout, Belgium. Tulip pokal shape with .3L mark. Fleur-de-lis style decoration and brewery logo. Tripel Karmeliet is a popular Belgian beer first brewed in 1996. The glass measures about 8 1/2 inches high by 5 inches in diameter at the widest point. Top is 3 inches in diameter.